I represented both the seller and the buyer. Variable price range $1,599,000-$1,699,000. Stunning home in desirable Descanso community in Del Sur, located on a prime canyon lot offering panoramic sunset views! Highly upgraded & beautifully appointed throughout this home shows like a model. 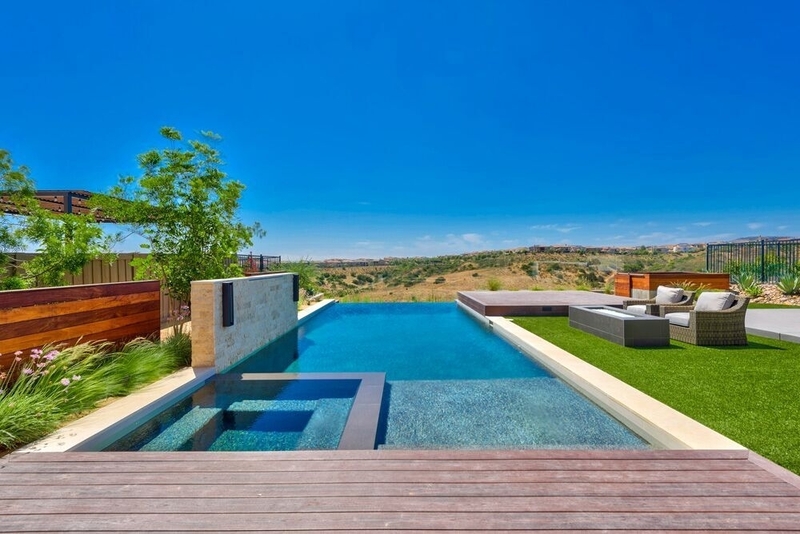 The gorgeous backyard is an entertainers dream featuring a custom vanishing edge pool with waterfall, spa, fire-pit, built-in BBQ, designer lighting, multiple patios. Infinity doors from the great room to the Del Sur Room offer the ultimate indoor/outdoor living experience. No expense was spared in customizing this home! The kitchen features upgraded cabinets, granite counters, stainless steel appliances, 6 burner wolf range with custom exhaust hood, sub-zero refrigerator, large walk-in pantry. The adjacent prep kitchen with additional dishwasher makes entertaining a breeze. The luxurious master suite offers a spacious balcony for relaxing & enjoying the beautiful view as well as a fabulous walk-in closet with custom built-ins & upgraded master bath. Also upstairs there are 3 ensuite bedrooms, a spacious loft & convenient laundry room. Downstairs there is another ensuite bedroom, perfect for a guest room, as well as a multi-purpose room off the kitchen with a dutch door to the backyard. Other features include LED lighting, upgraded cabinets and bathrooms throughout, solar, upgraded window casings, beautiful wood flooring upstairs, Italian tile flooring with epoxy finish downstairs, custom storage systems and epoxy floor in the garage. The front of the home is attractively landscaped with water saving efficiency in mind. The private entry features a loggia and courtyard with a peaceful water feature. Once inside you will be amazed by the view through to the stunning backyard, pool and view. Make this your home and enjoy the Del Sur lifestyle with it's 14 parks, 13 pools, 18 miles of trails and open space as well as activities for adults and kids year round.